On design trends, we’ve certainly been seeing a lot of weaponry showing up - but this revolver/handgun(?) 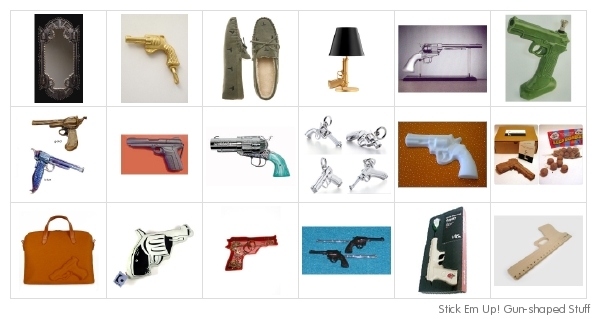 trend has become even more predominant as of late… Laura Sweet seems to have been picking up on a lot of the NOTCOT finds this week, and has compiled quite a comprehensive list of gun inspired goods in her “Stick Em Up! Gun Shaped Stuff” List. “As a design shorthand, it makes subtle use of specific colors, images, typefaces and the promise of what marketers call “an authentic narrative” to sell food. Especially in recent years, greenwashing has spilled out well past the organic section of the grocery store. Even the snack aisle at the gas station isn’t immune. 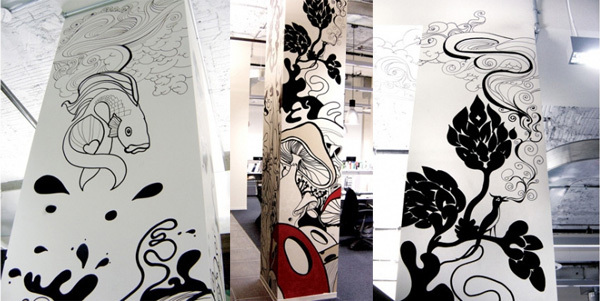 The work of McFaul got posted on .org and its been the inspiration fixation of the day… check out these murals he did for the BBH offices. Also noteworthy is the Bernstein & Andriulli site UI, something really nice and clean and sleek i’m loving about it. Stella Im Hultberg… my art obsession of the week. Her more recent pieces have been mesmerizing me since the Oddica Cotton to Canvas show. There is something about the tea stained paper plus oil and water colors and those dreary bored apathetic droopy edgy girls that pretty much embodies how i’ve felt this week. And can you believe she has a series of prints in her store you can purchase for a mere 20$? signed and titled even. So who is Stella? According the the bio on her site “Stella is a painter and drawer living in New York City. Pentagram takes Saks Fifth Avenue’s branding to a new level - nearly a googol of possible logo iterations and STILL have people know its Saks? That’s the type of proposal that most designers would run, hide, and cry about. Waking up and seeing the post at 30gms that pointed me to Michael Bierut’s Pentagram post has had me giddy all morning… the black and white, the mathematical shuffle, the balls to slice up a clients logo till nearly unrecognizable and still so perfect… i LOVE the boxes and and imagery it creates, and it scales endlessly. “A new identity designed by Pentagram for iconic New York retailer Saks Fifth Avenue launches on January 2, 2007. Partner Michael Bierut describes the process behind the development of an identity with more variations than there are electrons in the known universe.” The post (case study) itself is so beautifully written, it will leave you with more branding understanding than most intro courses. Are you confused? Are you excited? B/c i’m ecstatic and want to go. So go grab your envelope… get creative… and get mailing. Video to get you fired up below. If you watch one trailer this week - this is THE one to watch if you want to get your inspiration fix. Because after those few minutes i can’t wait for 2007, and i’m buzzing to shake things up with all my insane ideas. Brought to you by the One Club, The Alchemists is “about 5 people who hated the world so much…they changed yours”. So whether you’re a designer, or a lover of the behind the scenes process of these objects we love… i just noticed Design Sketching over at IDGrid. What makes this book unique is that it is the product of 24 very talented design students of Sweden’s Umeå Institute of Design - with the goal to “inspire and teach sketching by displaying a broad collection of examples of all the large variety of sketches that are useful in the design process. ” The authors, Erik Olofsson and Klara Sjölen graduated in 2005, and founded this publishing group to get this book out there - so support your fellow design students! It looks like an inspiring one to add to the design library. Eyecandy warning - the images of Miss Bibi’s miniatures, which are some of the most stunning jewelry pieces to have graced the pages of NOTCOT this year, can be seen in all their glorious context below! Fresh off the press is Jean-Michel Berts’ “The Light of Paris” with introduction by Pierre Assouline (and published by Assouline). While i have noticed i’ve been on a bit of a skate deck and photography kick the last few days, these are absolutely breathtaking, and a must see for any Paris lover… or cityscape lover even. Excerpts of some of my favorite images from their site below… Luxus mentions that these are taken with a camera obscura, the main site simply says “These pictures involved a highly sophisticated technique and more than twelve months of preparation. Jean-Michel was intent on revealing all the subtleties, all the richness of the destinations he had chosen for this project. The shots were taken in the early morning or late at night, to meet specific lighting requirements. The artist has intentionally focused on man-made constructions, devoid of human presence, in order to allow them to “live”, to exist, in their own right.” And either way, the effect is mesmerizing and timeless. You can digitally flip through an excerpt of the book here. It was a tragedy what happened to James Kim, loving husband, father, and CNET Senior Editor, and it’s truly amazing all he did to care for his wife, Kati Kim, and the couple’s two daughters, Penelope, 4, and Sabine, seven months. For all the design lovers, you probably know their store Doe SF. Design Sponge just featured the Kim Family Benefit and Craft Auction. Over 40 different artists have contributed auction items in a wide range of media. You’ll find paintings, prints, ceramics, soft toys, jewelery, paper goods, home decor and more. 100% of the auction proceeds will go to the Kim Family Fund. Bidding will begin January 3rd and end January 7th. 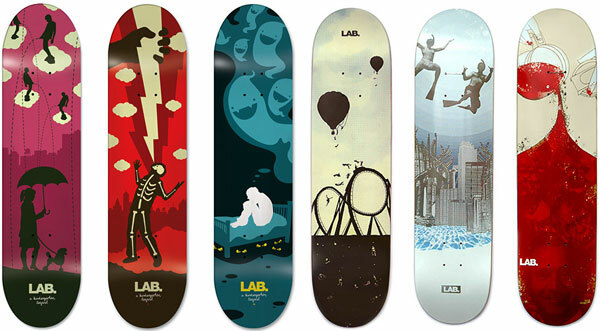 Emil Kozak is my obsessive inspiration for tonight ~ from these skateboards he did for the LAB, Hulger phones, beautiful photography of his travels, to playful self portraits ~ i just can’t seem to get enough of his work right now. Originally from a small town in Denmark, this graphic design genius surfs and skates his way around the world, but his studio is Barcelona based. I’ve been going through every section of his site over and over, and a collection of the pieces which inspire me most are below, but really - go browse every nook of emilkozak.com, and try not to drool on your computer when your jaw drops at his work.